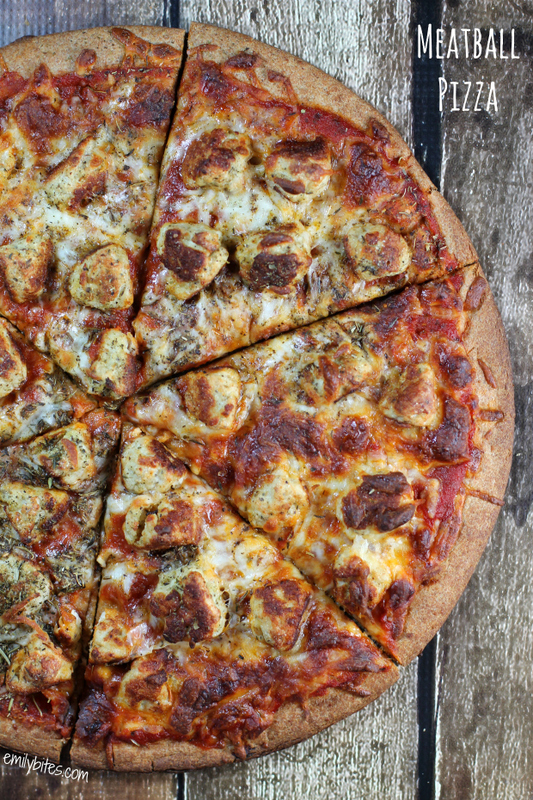 I’m back, I’m married, and I’m bringing a recipe that combines two of my favorite things in the whole world: meatballs and pizza! So, basically everything is pretty great – what’s not to love? This Meatball Pizza is so good. 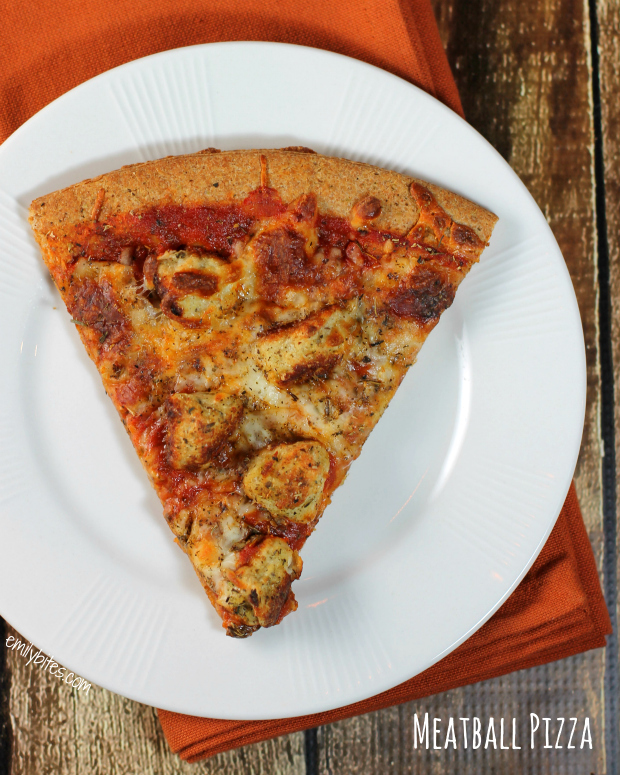 Hearty, meaty, saucy, cheesy and all on a tasty, crispy wheat crust. Meatballs are one of my favorite foods, and these little babies do not disappoint. I actually modified the meatballs recipe from my Spaghetti & Meatball Soup, so if you’ve ever tried that you already know they’re moist, flavorful and kind of adorable to boot. When I make pizza I always want it to be fast and easy, and Boboli crusts are great for that. If you prefer to make your own crust you certainly can. My husband (yay, I get to say that now!) gave this a big thumbs up and said it was “really meaty…I like that.” This could definitely be a crowd pleaser for game day or for a quick weeknight dinner. Looking for more pizza ideas? Check out my Thai Chicken Pizza, Meat Lover’s Pizza, Chicken Alfredo Pizza, Buffalo Chicken Pizza, Cheeseburger Pizza, Margherita Pizza, Mexican Pizza, Barbecue Chicken Pizza, Pepperoni & Pineapple Pizza or Bacon, Egg & Cheese Breakfast Pizza. Thanks for all the well wishes while I was gone on my honeymoon – I love you guys! In a large bowl, combine the ground turkey, garlic powder, Parmesan, breadcrumbs, ¾ teaspoon of the Italian seasoning, egg white and milk. Using your hands (or a spoon), mush all the ingredients together until well combined. Mixture will be somewhat wet. Roll meat mixture into 20 separate (3/4” – 1”) mini meatballs. In a large skillet, bring the olive oil over medium heat. Add the meatballs to the oil and cook them, stirring occasionally until all sides are browned and meatballs are cooked through. Remove meatballs to a dish and set aside. You may want to cut the meatballs in half so that they lay flatter on the pizza (I did with most of them). Spread pizza sauce evenly across the top surface of the pizza crust, leaving at least a ½ inch edge around the outside. Sprinkle the shredded mozzarella evenly over the top and spread the meatballs out across the surface. Finish the pizza by sprinkling the remaining teaspoon of Italian seasoning over top. This pizza is perfection 🙂 I adore meatballs on pizza! Congratulations Mr & Mrs Bites!!! Wishing you a lifetime of happiness, great health and success… and a lifetime of enjoying these awesome recipes!!! How much of a difference will 2% milk make in the nutritional content of this? I have two little ones and a husband who will not bend on the milk…:) Thanks! Hi! I’m making this tomorrow and am wondering if you think we could make the meatballs ahead of time and refrigerate them. Thanks!